Bio SoCal is the most trusted and referred decontamination and cleanup company in Southern California. It is our first priority to complete decontamination in a discrete and compassionate manner for all Bio SoCal clients so the client can be both physically and emotionally safe when reentering the property. Bio SoCal provides biohazard cleanup services after crimes, traumatic accidents, suicide, or unattended death scenes. When a suicide, homicide, or traumatic death occurs. Bio SoCal is the best choice for assisting victims and their families. Call Bio SoCal now. We are here to help. We can discus your options and provide you information and answer any questions you have regarding our services or what you can do yourself. Bio SoCal is insured, bonded, and licensed with a Trauma Scene Waste Management Practitioner License issued by the California Department of Public Health. We can legally collect, transport and dispose of biohazard waste. When you call Bio SoCal you will speak with directly with the owner, Alan, who will listen and ask you a few questions and then review in detail the next steps. We want to be sure that the right equipment and crew is dispatched to your location. Alan will give you an ETA for the Bio SoCal crew to arrive on scene and begin cleaning. Bio SoCal is locally owned and operated in Southern California and services all cities in Los Angeles, Ventura, Orange, San Bernardino, riverside, San Diego and Santa Barbara Counties and has with affiliations across the country. When you call Bio SoCal, the owner will answer the phone 24 hours a day, 7 days a week. No other company provides this level of support. Unlike other companies you will never be connected to a call center in another state, get passed along or have to leave a message to be called back. Upon dispatch the lead technician will call to update you on the actual ETA based on road conditions and distance. Bio SoCal will arrive in a plain white unmarked truck to ensure discretion and confidentiality. Bio SoCal technicians will never disclose the purpose of their arrival unless it is the client. Upon arrival Bio SoCal’s lead technician will introduce him or herself and ask to access the situation. He or she will make a an initial assessment and discuss the remediation plan with the client. Client will be asked to fill out the work authorization prior to the beginning of the cleanup. We typically can be on scene or job site within 60-90 minutes. We are very discrete and arrive in white unmarked vehicles. The crew will work their way in to the scene to mitigate further contamination. Hard Surfaces will generally be cleaned and decontaminated. Soft surfaces will be removed so that we can ensure that all layers of saturation are removed. It is a layer-by-layer process. Soft surfaces include but are not limited to carpet, pad, mattresses, curtains, clothing and any contaminated items that is porous. Once hard surfaces are cleaned, specifically hard flooring the surface will be chemically tested to ensure that biohazards have not gotten into flooring seams. If it has the flooring will need to be removed so we can access the subfloor to clean and decontaminate the sub floor or in extreme cases remove any wood subfloor or structure that has absorbed the biohazards or needs to be removed to access the biohazards. When we are done the home will be free of all biohazards and the scene will be fully decontaminated. In cases on undiscovered death and decomposition cross contamination can occur as a result of the many flies that are attracted to the biological matter. Small droplets of biohazards will likely be found on doors, walls, windows, window sills/fames etc. All droplets will be cleaned and decontaminated. Odor is also a significant issue to remediate in cases of undiscovered death which results in decomposition. 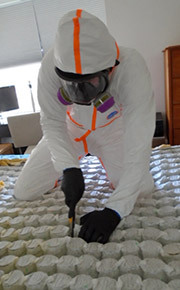 Biohazard remediation, cleanup and decontamination services are usually completed within a few hours in most cases. Some scenes are extensive and require more time but not typically more than one service call. Home Owner, Vehicle, and Business Insurance, covers the cost of the cleanup and replacement of remediated items and structural repairs. Bio SoCal typically does not require any payment before or at the time of service for crime, suicide, or undiscovered death cases unless it is a private pay situation and a homeowner’s claim is not possible or there is no policy in place. Payment arrangements can be made for business clients and their internal payment procedures. Proper removal of biohazard waste is critical in order to avoid exposing others to dangerous pathogens and diseases such as Hepatitis B (Serum Hepatitis), Hepatitis C( HCV), HIV and AIDS, Tuberculosis, Bacterial Meningitis, Creutzfeldt-Jakob Disease (CJD), among others. Upon completion the lead technician will explain next steps. In the case of a home with an insurance policy we will file a home owners claim on your behalf and explain the situation in detail to the adjuster so you don’t have to relive the traumatic event. We never want you to be re-victimized during the process. Any odor will be also be addressed and the process and next steps explained to the client. The owner of the property will be given letter of completion which will be accompany in any real estate disclosures and will indicate that the home has been professionally cleaned and decontaminated. Bio SoCal works directly with families, friends and individuals and partners with crisis intervention teams, human services, cities, police, fire, emergency services personnel, victim services groups, apartment and hotel managers, hoarding task forces, insurance agents and adjusters, big and small companies, psychologists, professional conservators, realtors, property managers, public venues, and family members to clean, decontaminate any biohazard to restore property and ensure good health. If you have questions or concerns you will always have a direct line to the owner who will help you any way he can. We have strict confidentiality and social media prohibition policies in place. No photos will ever be shared or made public and only used for internal and insurance claim processing. All Bio SoCal crew members have extensive training and have proven to be trustworthy. Any materials contaminated with blood born pathogens or any other potentially infectious materials must be disposed of as a regulated biohazard waste. Only a licensed company like Bio SoCal can legally do that. Bio SoCal has not had a complaint or a single citation in all of our years in the industry. Employers must follow strict guidelines as prescribed by OSHA Regulation 29CFR1910.1030 which mandates proper comprehensive training before an employee is placed in a position that could expose them to any biohazard such as blood or bodily fluids. Call Bio SoCal to ensure that you hire a licensed, processional discrete crew that is highly respected, proven and thus also contracted by many cities, counties and the state.